Albert Einstein's General Theory of Relativity explained gravity as the geometry of space and time. Einstein promptly applied these ideas to the universe as a whole in 1917. He needed to add in a "cosmological constant" to make a static universe, to agree with the astronomical observations of his day. Ten years later, astronomical evidence began to accumulate, we do not live in a universe that is static, but an expanding one. Einstein's introduction, then retraction, of the cosmological constant has been dubbed, "Einstein's greatest blunder" (though not by Einstein!). One of the great recent surprises in science is the astronomical discovery in 1998 that the expansion of the Universe is speeding up. In this talk, I will describe how we know the Universe is accelerating from the measurement of exploding stars. The explanation for this accelerated expansion on the largest known scale is that it is driven by a mysterious "dark energy" which may be a result of fundamental forces acting on the smallest distances in nature. In a strange turn of events, the simplest form of the dark energy is something that looks very much like a modem version of Einstein's cosmological constant. I will sketch the evidence for this strange new picture of the Universe, and describe ongoing investigations that may reveal the nature of the dark energy. Robert P. Kirshner, Clowes Professor of Science at Harvard University, one of the world's leading astronomers and popular public lecturer on science, and author of "The Extravagant Universe: Exploding Stars, Dark Energy, and the Accelerating Cosmos." Kirshner is described by Discover Magazine as a "raconteur of exceptional eloquence," and by New Scientist as "one of the liveliest and most amusing lecturers in the world of astronomy". 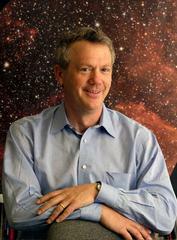 His research has resulted in significant and surprising breakthroughs on the nature of our universe. 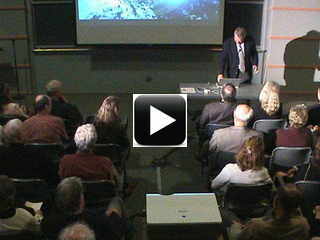 Movie of introduction by David Gross.